Luxurious Long Black Nightgown with Double-Layered Bodice Lace front bodice and Nylon Spandex Back Bodice with Miniature Roses and a FANCY Triple Ruffle Hemline. Shimmery Midnight Black Long Lingerie Dress Nightgown with Pink Chiffon & Miniature Flowers Size 2XL Soft, sensual and frothy Designed to showcase one's assets in the most flattering style. 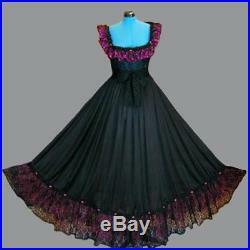 The front bodice is darted, triple-layered (beautiful lace in between sheer black nylon) and the back bodice stretches. There is a long wide sash belt that accompanies the gown. MEASUREMENTS OF GARMENT Bust 48" and the back bodice does stretch as the fabric is Lycra Spandex Waist 46" and it stretches nicely with fabric give Hips are pretty much unrestricted due to skirt's flare Length 62. VALUABLE INFORMATION YOU SHOULD KNOW. Merchandise is brand new with or without tags and has no apparent defects. Reserved for pre-owned (used) merchandise that could pass for brand new. Item has been gently worn or used and may show very minor (normal) signs of wear. Item shows considerable wear and may have a minor flaw, which will not take away from the beauty of the merchandise, such as an abundance of picks (tiny pulls in the fabric) or a noticeable sewing repair, minor discoloration, which is not easily noticeable or minor scratches on the merchandise. Item shows considerable signs of wear. It may have slight defects, which are not limited to discolorations and stains that effect the appearance of the merchandise is not recommended to be given as a gift. It is against the law for us to provide false information regarding the value of the merchandise or to mark the item as being that of a gift. Although many of our garments may appear brand new, for the most part, they are not. We sell classic vintage, retro & contemporary lingerie, clothing, collectibles and jewelry that have been gently used and lovingly cared for over the years and most likely will show minor wear. We restore, design and clean fine vintage lingerie pieces. Our garments come from a SMOKE & PET FREE environment. There are some occasions when a dress, suit, blazer or coat may require dry cleaning. When an item requires cleaning, we note in in the description. Our measurements are taken with the garment laid flat. The bust, waist and hips measurements are taken across the garment (not necessarily always seam to seam), then that number is multiplied by two. The measurements across the shoulder blade area and the length measurements are not doubled. The measurements for the armhole represent the full circumference of the armhole opening and closing. The length of the sleeve is from the shoulder seam to the end of the sleeve and when the garment does not have a shoulder seam (as is the case of a Dolman sleeve), we will use an approximate area where the seam would traditionally be located as the starting point. Our garments are fitted to the model, mannequin or dress form. Please select the design/style of garment that best flatters your figure. Allow an extra 1" - 3" for comfort. Who will come back again and again to shop with us and tell everyone they know about PMTL, therefore we provide the most accurate. Description to the extent our ability and knowledge of the item being offered. We encourage you to ask questions after you have read the description and reviewed the pictures. We love to pamper our customers with the wonderful treasures we have searched high and low to find and/or designed and make from scratch just for you. We are a small business and we treat everyone as we would like to be treated so needless to say, we will do our absolute best to meet or exceed your expectations. Our company name does not appear on your package. - only our company initials appear on your package. Our return address is our company's initials (PMTL). We do not note on the outer package the contents. Thank you or shopping at. The item "Stretch Top L Sweep Tall Black Dress Couture Gown Vintage Lace Slip Nightgown 2X" is in sale since Tuesday, July 24, 2018. This item is in the category "Clothing, Shoes & Accessories\Women's Clothing\Intimates & Sleep\Sleepwear & Robes". The seller is "pampermetonight" and is located in Fairfax, Virginia.